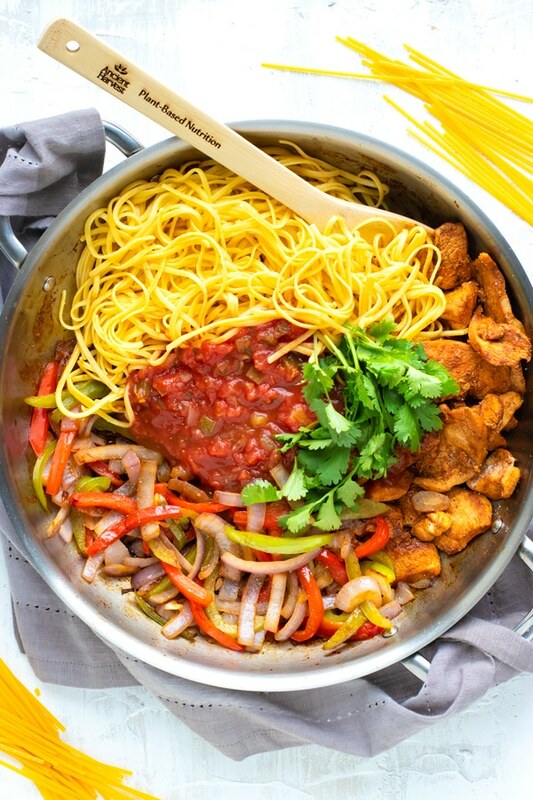 Chicken Fajita Pasta for those Indecisive Nights! The ones where you and your spouse go back and forth trying to decide. Do you want Mexican food? Italian food? Seafood? Indian? Deciding on one specific cuisine can be downright exhausting. Not to mention the debate that might ensue if you and your sweetheart do not agree! OK. Really it’s just combining your two favorite cuisines into one amazingly flavorful dish… like in this chicken fajita pasta recipe! 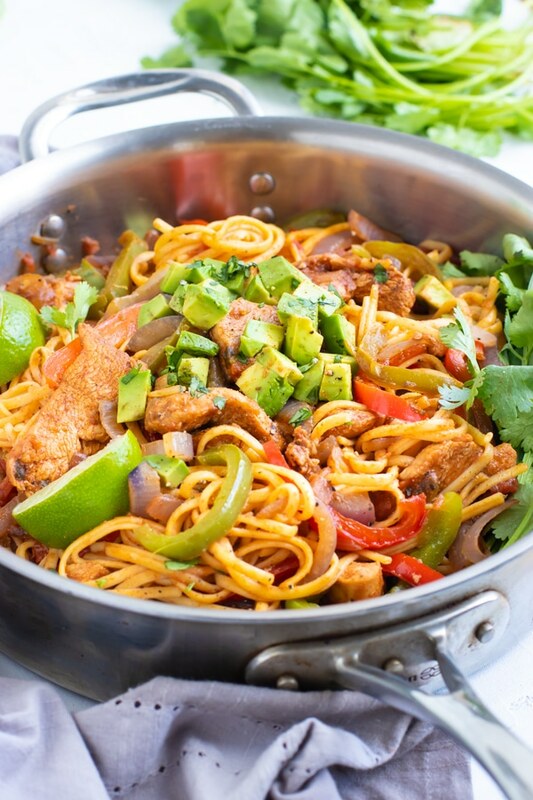 All of the Mexican flavors that you know and love in chicken fajitas are combined with linguine pasta to form a fajita pasta that will make your taste buds dance. One of my favorite aspects of this chicken fajita pasta recipe is that the veggie : pasta : chicken ratio is pretty equal. And the best part? You can adjust it to your preference! Want more bell peppers and onions? Or maybe a bit of mushrooms in this fajita pasta? Toss ’em in! Only have spaghetti noodles and no linguine? Not a problem! This chicken fajita pasta is completely versatile to make your crazy weeknight just a little bit less hectic. 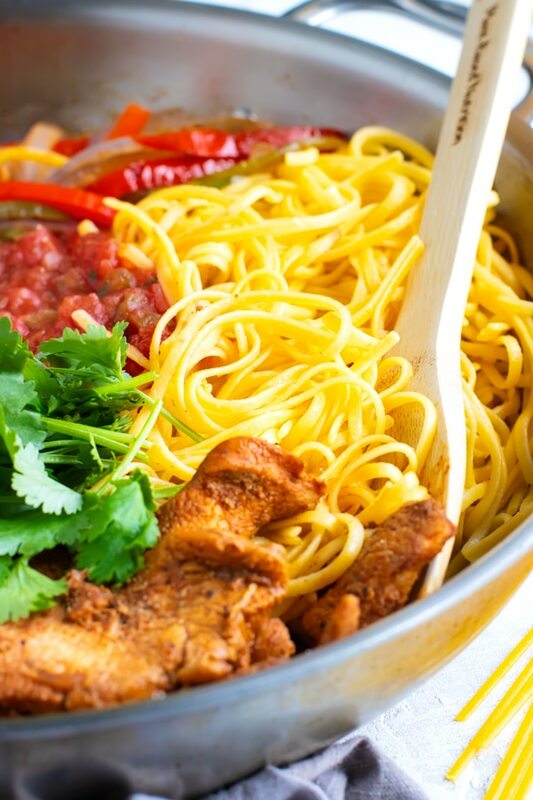 What Type of Pasta is in this Chicken Fajita Pasta Recipe? First off, is pasta gluten free? No, pasta is definitely not naturally gluten free, but luckily, there are some incredible gluten free pasta brands in the market now! 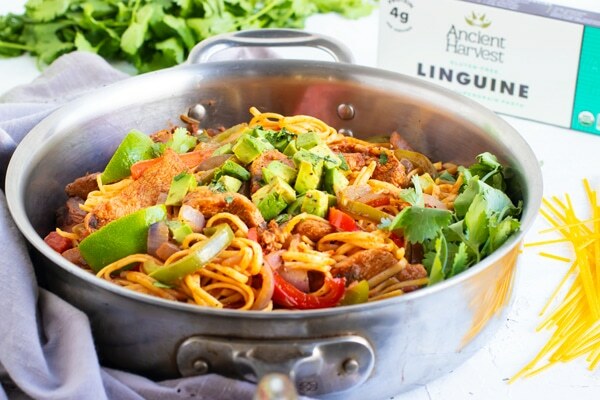 One of the best gluten free pastas to use is Ancient Harvest… and especially their supergrain pastas! This gluten free pasta is made from just a few ingredients (the linguine only has quinoa flour and corn flour! ), holds its shape, and still tastes amazing. I have found Ancient Harvest Supergrain pasta in my local grocery store as well as online through Amazon. Err on the side of cooking your gluten free pasta a little al dente. This is especially true in this chicken fajita pasta recipe. Gluten free pasta tends to break apart quickly if overcooked. Dont want to eat all of the pasta in the same sitting? Only cook as much pasta as you want to eat right then. Reheating gluten free pasta has a tendency to make it break apart more easily. Uh oh! You cooked your pasta before the veggies and fajita chicken were done cooking! Not a problem! Simply toss them with a bit of the salsa that will be used to prevent the noodles from sticking. Your pasta is all stuck together? Make sure to add your gluten free pasta to the boiling water and give it a good stir. If you are still having trouble with your pasta sticking together, try adding a bit of olive oil to the water while it is cooking to keep your noodles separated. 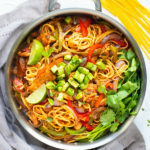 So you have your gluten free pasta cooking away, what other ingredients go into making this chicken fajita pasta recipe? Honey – this gives the chicken fajita marinade a touch of sweetness. Soy sauce – you can also use gluten free Tamari sauce or liquid coconut aminos. Lime juice – try to use fresh, if you can. Salsa – we’ll talk about this ingredient below! Cheddar cheese – opt for a dairy-free cheese or leave it out completely if you are dairy-free. What Type of Salsa is in this Fajita Pasta Recipe? I have made this recipe quite a few times and have used various salsas with great results. If you have kids you may want to get a salsa that is less chunky so they do not see the chunks of tomatoes. Select a mild salsa if you want your pasta at a 2-3 spice level out of 10. A medium salsa will put the spice level up to a 5-6! Pick a salsa that you love the taste of all by itself. 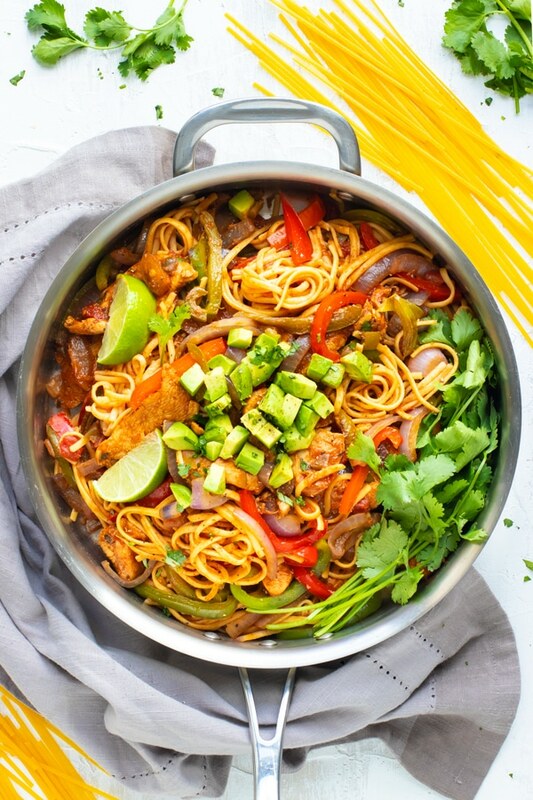 Chicken Fajita Pasta combines the best of both words by mixing together your favorite Mexican food with gluten free pasta to form a healthy and easy pasta dinner recipe! Whisk together chicken fajita marinade ingredients in a medium-sized bowl. Add sliced chicken and marinade to a gallon-sized ziplock bag. Marinade chicken for 10-15 minutes. Saute peppers, onion, and ½ teaspoon salt in olive oil over medium heat for 5-7 minutes. Push vegetables to the side of the skillet and add chicken with marinade. Cook for 6-8 minutes, or until chicken is cooked through. Add linguine, cheese, and salsa. Stir until combined and heat up for 2 minutes over medium heat. Serve with cilantro and avocado. Enjoy! See this recipe in Meal Plan #6. *Nutrition facts calculated without optional toppings. 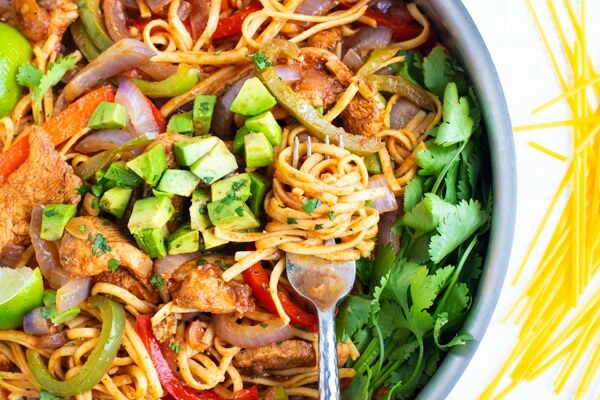 Want more recipes like this Chicken Fajita Pasta Recipe? This recipe looks like one my kids will love! Thanks for sharing. They totally will!! Thanks so much for your comment and rating!